If you’ve just been offered admission and checking your JAMB admission letter they wrote 4 years degree course instead of 5 years you’re expected to use for your course, you will find this post resourceful. Some candidates had been thrown into confusion after checking the year or duration of their programmes JAMB wrote on the admission letters. JAMB writes 4 instead of 5 years. Is this a mistake from JAMB or school? What can you do about it? Won’t it affect you in the future? 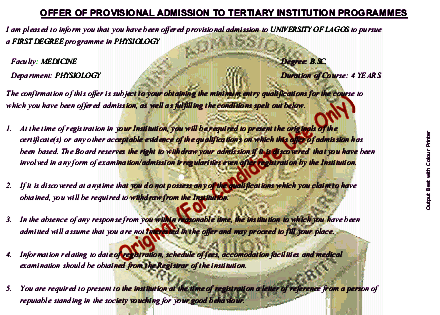 JAMB has from years, designed templates for JAMB admission letters. If you pay for the letter online and print, the same template for other admitted candidates will be used to prepare your own letters. A few things that will change are the admission year, the course, candidates’ biodata and courses of study. The entire wordings for the letter will remain the same except those mentioned above. Among the other wordings is the year/duration of your course in the university, polytechnic or college of education. JAMB has different templates for NCE admission which carries 3 years course, for polytechnics 2 years and for universities 4 years. So if you’re a university student, your letter will carry four years no matter the official year of your proposed course. In case you’re confused with the explanations above, courses like Engineering, Agriculture, Nursing, Medicine etc should read 5 or 6 years on the letters. Yet, JAMB will write 4 years for them as well. Sample of letter with 4 years instead of 6. In other words, JAMB use 4 years as a base for university admission. If you see a difference in the year of the proposed course and the 4 years written by JAMB, know it – it’s not an error. It’s the standard used by JAMB for all. If you check a friend’s letter, it reads the same. Won’t that affect you in the Future? I don’t think so. Why? This is an official document and it’s a general issue. 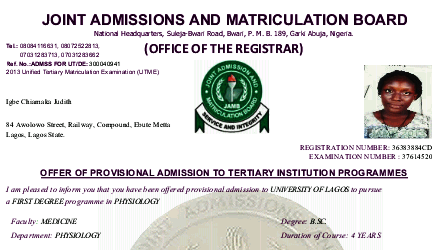 If anybody or organization is confused about the years written, they have direct access to JAMB for confirmation. You have no need to panic about this.